Welcome to the first installment of The B Series, a blog project that features, interviews, reviews and showcases B Corporations who are redefining what it means to do business. B Corporations are certified companies that meet a rigorous set of standards relating to social and environmental performance, accountability and transparency. Certifications are administered by the B Lab, a nonprofit which seeks to encourage companies to create systemic change. This week’s inaugural review features the very innovative, tasty and trendy Beau’s All Natural Brewing Company. In celebration of the company’s 9th birthday–which it proudly shares with Canada Day–Beau’s is taking time to reflect on their many accomplishments. Back in 2006, father Tim and son Steve Beauchesne founded a craft brewery, alongside their family and friends, with the hopes of bringing the art of brewing back to its roots. Historically, brewing has had a long history of creating a sense of community–something the Beauchesne family knew was missing from the current beer market. With a passion to bring craft brewing back to its origins, Beau’s makes it a point to ensure that their practices are sustainable, ethical and beneficial to the world. 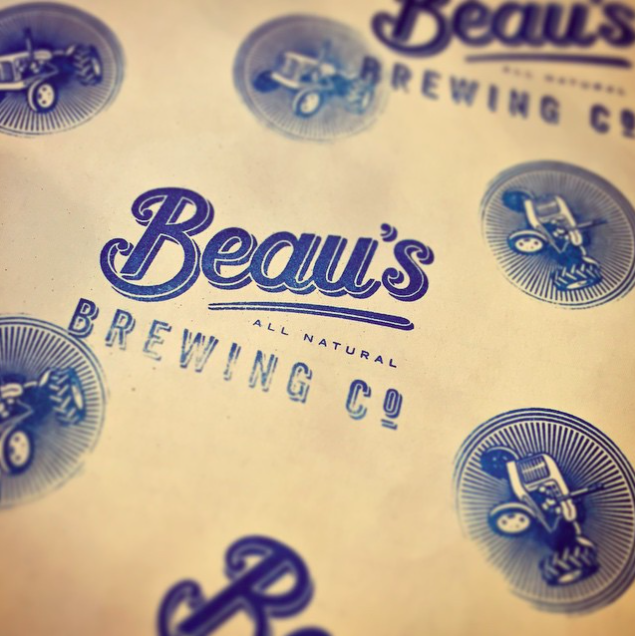 CSRtist: What makes Beau’s different from other craft brewers? Steve: Our enthusiasm is what sets us apart. Here at Beau’s we all live by one mantra: we can achieve anything–the only thing that can hold us back is our will to try….and we always try. Our company started out with virtually no money, but it was that sense of optimism, that drive to try and that commitment to sustainability and our community that helped us reach our dreams. Another really cool aspect that sets us apart is the fact that we were the first Canadian brewery to attain B Corp certification as well as the first craft brewery in Canada to use 100% green natural gas for our operations. We use green energy for both our electricity and natural gas needs with the support of Bullfrog Power. We continue to build on those same values we started the brewery with back in 2006. CSRtist: What made you decide to become a B Corp? Steve: It was definitely a progression of events that got us to that point. Becoming certified organic was one of those first steps that eventually helped guide the path for us towards becoming B Corp certified. Though we’ve always used high quality ingredients in our beers and ensured leading brew practices, we never saw the benefit of officially certifying ourselves as organic. But our customers kept asking us, “Well if your beer is organic, why isn’t it certified?” We soon realized that our customers wanted that trusted 3rd party certification. So in 2008 we became certified organic. When we found out about the B Corp certification, we knew from our past experiences that the external stamp of approval would give our customers that added level of accountability and transparency they expected from us. Unfortunately, there’s a lot of greenwashing out there these days so people need more than just your good word. Becoming B Corp certified was important to us because we wanted to showcase that our company was ethical and sustainable inside and outside of the beer bottle. The B Corp certification does this by assessing your company’s human resources practices, your community involvement as well as your sustainability. CSRtist: What have been the positive effects of your decision to go B Corp? Steve: Every two years we’re required to take the assessment to renew our certification. What we’re left with is really beneficial for our strategic business plan. We’re given a report card that we use as our benchmark to celebrate all of our successes, but also acknowledge our gaps and grow where there are opportunities for improvement. The assessment helps us look at our company from new angles we may have never considered on our own. CSRtist: Tell me a little bit about the significance of your 9th birthday? Steve: This one’s a pretty big milestone for us. It’s funny because we initially decided to launch our business on the same day as Canada Day with the hopes of throwing a big bash every year, but our birthday has really transcended into a time of reflection for us. We really like to use this time of year to think about all of the things we’ve been able to accomplish and also realign our thoughts and goals about the future. By the end of this year, we plan to reach our target of having donated one million dollars to many worthy and meaningful causes and charities. It’s a pretty cool realization of the impact we’ve made. We’ve also just created our 100th brand of beer and brewed our 5,000th batch of beer this year! There’s a whole pile of things coming together and we’re excited about scaling these successes even further in the years to come. CSRtist: If you had to sum up your experience as a B Corporation in one word, what would it be? I’d have to agree with Steve and say that beer tastes better when you can feel good about drinking it. There’s no doubt that Beau’s is leading the way with regards to creating innovation in the craft brewing community. Not only do they ensure top quality ingredients and brewing practices in their beer products, but they’re also scaling their social and environmental impact throughout Canada and beyond. That’s something we can all raise a pint and cheers to. I welcome you to join the discussion and share your comments, questions and experiences in the reply section below or tweet using the hashtag #TheBSeries. Don’t forget to follow the blog and follow me on Twitter @CSRtist for all-things relating to B Corps and corporate good.